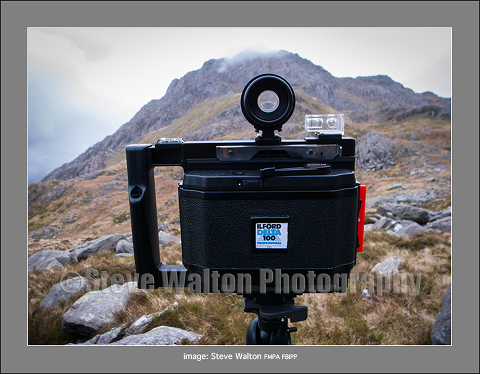 I had been looking for a new 6x12cm roll film back for my Cambo Wide 470xl and the Widepan 6×12 back seemed quite a good option at just £300, somewhat cheaper than a well-used Horseman back of dubious light-proof integrity. I’m familiar with the Widepan range of 6×17 panoramic cameras, they are comparatively well made as far as Chinese manufactured cameras go. Not as agricultural and rough around the edges as Gaoersi or Da-Yi offerings but nowhere near as refined as Fuji, Horseman or Linhof. Widepan offer good value at acceptable quality so I was prepared to take a chance with this back. 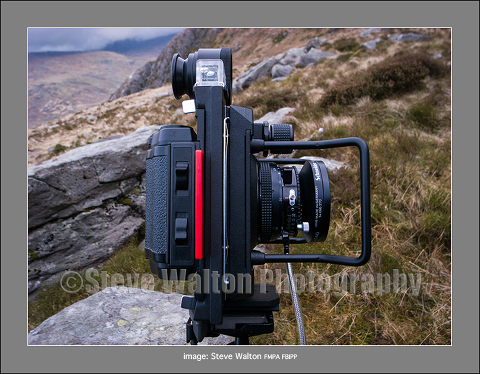 The first outing was to Ogwen for a couple of cold, wet and blustery February days. The light wasn’t up to much for most of the time I was there, but this does often add something to images from this area of Snowdonia. If it was good enough for John Clow, it’s good enough for me! The Widepan back is nicely finished with a textured plastic surface (no leather covering here!) with a frame counter and wind-on lever on the top, a wind-on unlocking slider button and film reminder holder on the back and two back door release catches on the right side as you are looking at this image. There is a standard dark slide and the initial impression is that this is a quite well thought-out back and the materials and workmanship are of reasonable quality. The back locks into place with the universal locking system and does not move when in situ. The side view shows the dark slide and release catches. These need to be pinched together to open the back. It might be a good idea to mark one side of the dark slide plastic handle as “exposed” to prevent double exposing frames. 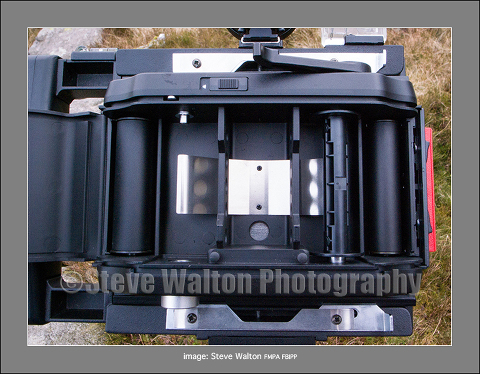 When open, the back reveals a fairly standard layout with two release buttons for the spring-loaded spindles for the film spools, a sprung steel film tensioner and a couple of substantial guide rollers to aid smooth film transport across the gate. Push the spool release button and the spindle pops out from the film spool and clears it instantly. 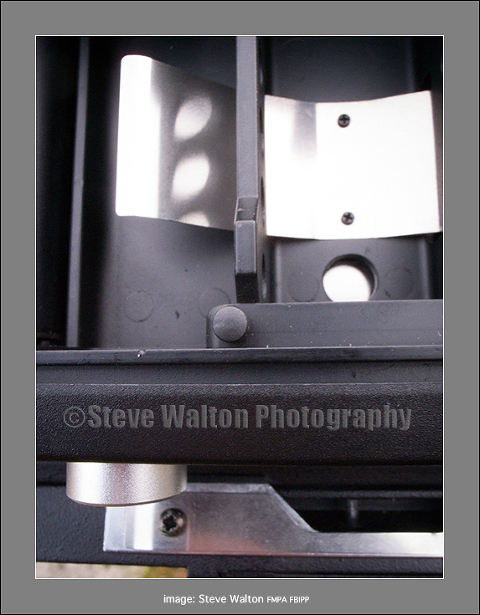 No annoying lip that requires fiddling with cold fingers to prise the film spool out of the take-up chamber! The spring has quite a positive and powerful action, clearly it is intended to last. Insert the roll of film into the left side chamber and feed it across the pressure plate to the take-up spool in the usual way, no surprises here. When the arrow appears in the circular cut-out window below the sprung steel tensioner, the insert is ready to be replaced into the back. the light-trapping flanges between the insert and the back are all very substantial and will not leak light. The back closes with a positive click. It all feels solid and reliable. The dark slide is conventional and provides a good firm seal when in place. There is no movement which indicates a reasonable standard to machining. Three strokes of the wind-on lever brings up frame number one in the window and the lever can be push in so that it does not protrude. I’ve been using this Widepan 6×12 foll film back for around 18 months and it is still as firm and positive in use as it was when new and there have been no light leaks I feel confident that I can recommend it to anyone looking for a comparable quality back to a Horseman back for a very good price from the usual auction site. For those interested, the two images below were made with Ilford Delta 100 and a Heliopan O22 filter at f16. Looking down to Llyn Bochlwyd from Tryfan.